A delicious way to cook your chicken topped off with roasted veg! I Butterfly or Spatchcock my chicken before roasting. It cuts cooking time by a ¼ See 200,000 related Google topics and videos on this to show you how. If I am using stuffing I place it on a sheet of tinfoil in my roasting tin and set chicken on top of this. Drizzle chicken with lemon Juice and cook in preheated hot oven until golden, approx. 1 hour. Don’t forget to throw in and cook the back bone that you have cut out, it adds to the flavour of the gravy. Peel and chop all vegetables into bite size portions, put into a separate roasting tray drizzle with olive oil and season, put into oven approx. 15 mins. after chicken goes in, cook until golden and tender. 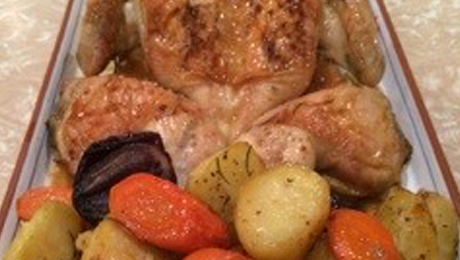 Serve Chicken on large warm plate surrounded by veg, spoon over juices from roast chicken tin. Tuck in.